There is a body of evidence that shows a link between tumorigenesis and ribosome biogenesis. The precursor of mature 18S, 28S and 5.8S ribosomal RNAs is transcribed from the ribosomal DNA gene (rDNA), which exists as 300–400 copies in the human diploid genome. Approximately one half of these copies are epigenetically silenced, but the exact role of epigenetic regulation on ribosome biogenesis is not completely understood. In this study we analyzed the methylation profiles of the rDNA promoter and of the 5’ regions of 18S and 28S in breast cancer. We analyzed rDNA methylation in 68 breast cancer tissues of which the normal counterpart was partially available (45/68 samples) using the MassARRAY EpiTYPER assay, a sensitive and quantitative method with single base resolution. We found that rDNA locus tended to be hypermethylated in tumor compared to matched normal breast tissues and that the DNA methylation level of several CpG units within the rDNA locus was associated to nuclear grade and to nucleolar size of tumor tissues. In addition we identified a subgroup of samples in which large nucleoli were associated with very limited or absent rDNA hypermethylation in tumor respect to matched normal tissue. In conclusion, we suggest that rDNA is an important target of epigenetic regulation in breast tumors and that rDNA methylation level is associated to nucleolar size. Epigenetic regulation of ribosomal DNA (rDNA) locus has a pivotal role in orchestrating ribosome biogenesis. Human cells contain about 400 copies of the ribosomal RNA (rRNA) genes organized as tandem, head-to-tail repeats [1, 2], which are located in the fibrillar centers and the dense fibrillar component of the nucleolus . Each unit is ~43 kb long and includes the 47S rRNA encoding sequence (~13 kb) and a non-transcribed intergenic spacer (~30 kb). In physiological conditions, around half of these copies is allelically inactivated through a combination of epigenetic mechanisms including late replication time , specific repression factors [5, 6] and methylation of rDNA promoter. 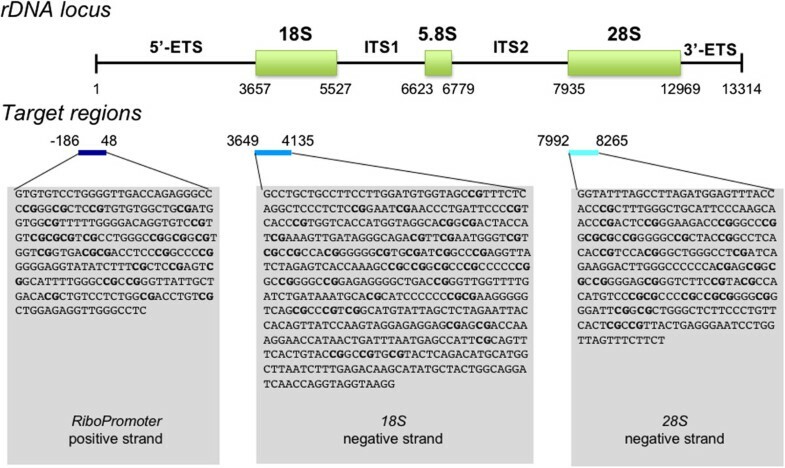 rDNA promoter includes a core promoter region, extending from −50 to +20 in respect to the transcription starting site (TSS), and an upstream control element (UCE) at −200 in respect to TSS. In humans, but not in rodents, both the UCE and the core promoter are CpG rich regions, classifiable as CpG islands, which usually show a complex methylation pattern [7, 8] that can affect rRNA expression [9, 10]. Bisulfite sequencing of clonal rDNA promoters has been used to characterize rDNA methylation status in several pathological conditions. Hypermethylation of rDNA promoter was described in brain from Alzheimer’s disease  and suicide subjects , while methylation levels of 18S and 28S 5’ regions were decreased in white blood cells from systemic lupus erythematosus subjects . rDNA hypermethylation occurs during aging , and accordingly accelerated methylation of ribosomal regions was shown in fibroblasts from subjects affected by Werner syndrome . The analysis of rDNA methylation in tumor samples appears to be in this context of extreme interest. Ribosome biogenesis is a limiting factor in sustaining the increased demand for protein synthesis, a prerequisite for cell growth and cell proliferation [16, 17], and, as consequence, the rate of ribosome production is notably enhanced in cancer cells. 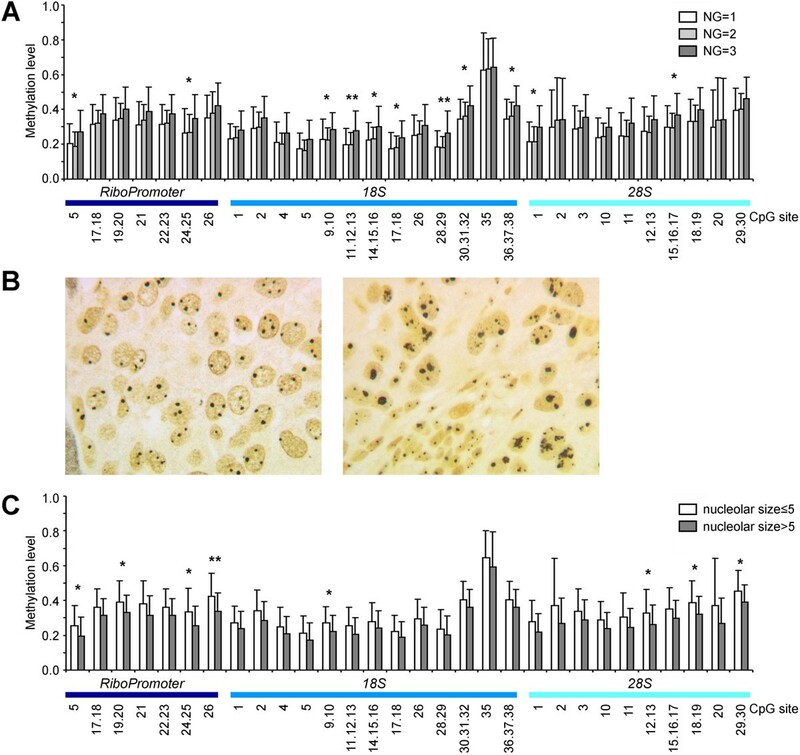 rDNA promoter was found hypomethylated in respect to corresponding normal tissue in human hepatocellular carcinomas  but not in prostate cancer . 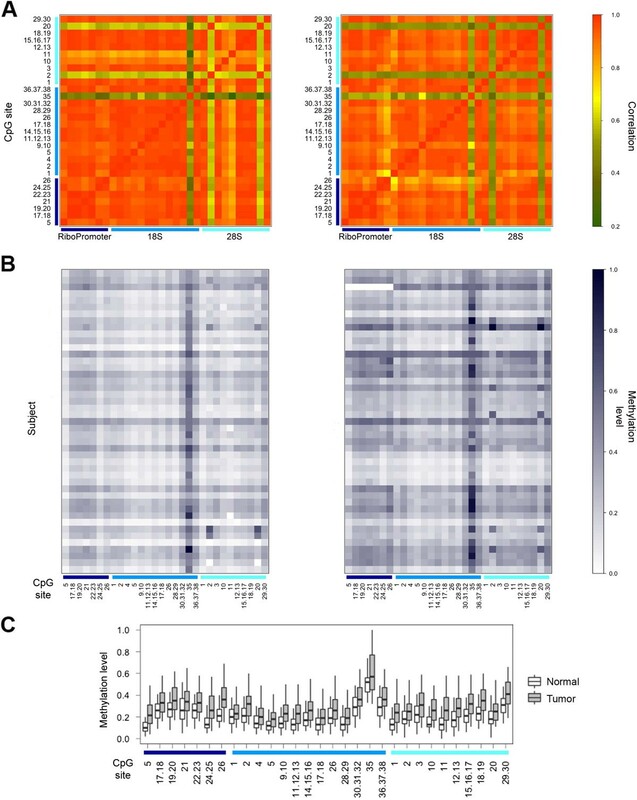 On the contrary, Yan and colleagues used methylation-sensitive Southern blotting to show increased rDNA methylation in patients with breast cancer compared to the normal control tissue; rDNA hypermethylation resulted also in association with specific tumor features such as the negativity of oestrogen receptors and poor tumor differentiation status . In this study we analyzed methylation levels of three different regions within rDNA genes (the promoter and 5’ regions of 18S and 28S sequences). In order to precisely define rDNA methylation profiles in breast cancer we used the MassARRAY EpiTYPER assay, a more sensitive and quantitative method compared to Southern blot and to clonal sequencing. Furthermore, we investigated a possible correlation between the methylation status of single CpG sites, ribosomal biogenesis and the available clinical and bio-pathological parameters in order to define its possible impact in the biological and clinical behavior of the tumors. The study was approved by the St Orsola-Malpighi Hospital’s ethical review board (approval number 75/2011/U/TESS). All volunteers provided written, informed consent. Sixty eight breast carcinomas were selected from a series of consecutive patients who had undergone surgical resection for primary breast carcinoma at the Surgical Department of the University of Bologna between 2005 and 2012, on the sole basis of frozen tissue availability. For forty five patients we collected both tumoral and non tumoral adjacent tissues (later on named normal tissue). Each patient’s clinical information was recorded and correspondent tissue was histologically characterized by a team of clinical pathologists to define its bio-pathological features according to standard criteria for both clinical parameters and TNM (Tumour-Nodal-Metastasis) classification . The expression of the oncosuppressor protein p53, Estrogen and Progesteron Receptors (ER and PR respectively) and proliferative markers ki67 was measured by experts after specific immunohistochemical (IHC) staining at the Operative Unit of Anatomy, Pathological Histology of the Sant’Orsola-Malpighi University Hospital in Bologna using NovoLinkTM Polymer Detection System (Novocastra Laboratories Ltd.) and following the manufacturer’s instruction. For IHC analysis, the following mouse monoclonal primary antibodies were used: p53 (1:400, Novocastra); ER (1:450, DakoCytomation, Glostrup, Denmark); PR (1:400, Novocastra); ki67 (1:200, Novocastra). Silver staining of Nucleolar Organizer regions (AgNORs) was performed as described below. Specimen collection and tissue analyses were approved by the Bologna University Ethical Committee on human tissues research. Tissues were preserved at −80°C until use. A piece of 60 mg for each sample was minced in liquid nitrogen and then lysed for total DNA extraction using buffers provided with NucleoSpinTissue Columns kit (Macherey Nagel) and following the manufacturer’s instructions. Quantitative DNA methylation analysis of rDNA locus was performed using the EpiTYPER assay (Sequenom). Briefly, 1000 ng of DNA were bisulphite converted using the EZ-96 DNAMethylation Kit (Zymo Research Corporation) as previously described . 10 ng of bisulphite-treated DNA were PCR-amplified using the following primers: Ribo forward: AGGAAGAGAGGTGTGTTTTGGGGTTGATTAGAG; Ribo reverse: CAGTAATACGACTCACTATAGGGAGAAGGCTAAAACCCAACCTCTCCAAC; 18S forward: AGGAAGAGAGGTTTGTTGTTTTTTTTGGATGTGG; 18S reverse: CAGTAATACGACTCACTATAGGGAGAAGGCTCCTTACCTACCTAATTAATCCTACCAA; 28S forward: AGGAAGAGAGGGTATTTAGTTTTAGATGGAGTTTATTATT; 28S reverse: CAGTAATACGACTCACTATAGGGAGAAGGCTAAAAAAAACTAACCAAAATTCCC. For each gene, CpG sites with missing values in more than 20% of the samples were removed, as well as samples with missing values in more than 20% of CpG sites. Five-micron sections were processed to perform the silver staining to visualize the nucleolar organizer regions and the argyrophilic proteins according to the guidelines of the “International committee on AgNOR quantitation” . Tissues were deparaffinized in xylene and rehydrated in decreasing concentrations of ethanol and distilled water. After antigen retrieval in citrate buffer pH 6.0 at 120°C, 1 atm for 21 minutes, the sections were then incubated in silver nitrate solution in a dark for 13 min at 37°C. The silver staining solution consisted of one part of silver nitrate (Diapath) and two parts of 2% gelatin (Sigma) in 1% formic acid (Carlo Erba) solution. Ultra pure distilled water was used for preparation of all solutions. The sections were then washed in distilled water, dehydrated in graded alcohol and xylene and cover slipped. The tissue was then ready for counts. After silver-staining, the NORs can be easily identified as black dots exclusively localized throughout the nucleolar area. Silver stained section was examined through a light microscope using Image-Pro Plus6 software (Media Cybernetics). The morphometric analysis was performed on a cell by cell basis of at least 200 nuclei and the mean nucleolar area was calculated. The best cutoff value for the nucleolar size variable was obtained by the receiver operating characteristic curve and corresponded to the value of 5 μm2. DNA methylation values resulting from EpiTYPER assay are reported as continuous values ranging from 0 (0% of methylation) to 1 (100% of methylation). All analyses were performed in R 2.14. For continuous parameters, the following thresholds were used in ANOVA and chi-squared tests: age > 50 years; diameter > 20 mm; p53 > 10% of positivity; Ki67 > 20% of positivity; nucleolar size > 5 μm2. p-values < 0.05 were regarded as statistically significant. To profile the rDNA methylation status in breast cancer, genomic DNA was extracted from 68 breast carcinomas samples; for 45 of them, pair-matched normal tissues were available. We used the MassARRAY EpiTYPER system to analyze the methylation status of three target regions (amplicons) in the rRNA gene (Figure 1): i) RiboPromoter, from position −186 to position +48 (respect to the transcription start site), including both the upstream and the core promoters of the gene; ii) 18S, from position +2946 to position +3432, encompassing the 5’-sequence of the 18S region; iii) 28S, from position +7297 to position +7579, encompassing the 5’-sequence of the 28S region. The three selected regions partially overlap with those previously analyzed in other studies [13, 23]. Location of the target regions selected for DNA methylation analysis within the rDNA locus. The picture reports a schematic representation of the rDNA locus and the location of the 3 target regions (RiboPromoter, 18S and 28S) that are amplified and analyzed by the MassARRAY EpiTYPER assay. Base positions are relative to the transcription starting site (+1) of rRNA primary transcript. For each amplicon the amplified strand is indicated, together with the sequence of the unconverted target region. The CpG sites whose methylation status can be assessed by the MassARRAY EpiTYPER assay are reported in bold. Abbreviations: 5’-ETS, 5’ external transcribed spacer; ITS1, Internal transcribed spacer 1; ITS2, Internal transcribed spacer 2; 3’-ETS, 3’ External transcribed spacer. The EpiTYPER assay returns quantitative methylation estimates of single CpGs or of small groups of adjacent CpGs (CpG units) depending on the sequence context. Using this method, we measured methylation levels of 8 CpG units (13 CpGs), 14 CpG units (26 CpGs) and 10 CpG units (15 CpGs) in RiboPromoter, 18S and 28S target regions respectively. In RiboPromoter amplicon, 7 CpGs were in the UCE region, while the remaining 6 were in the core promoter. The CpG units RiboPromoter_CpG_15.16 (UCE region) and 18S_CpG_6.7 did not pass quality controls and were removed from further analysis. We first considered the correlation between methylation values in the 45 samples for which both tumor and normal tissue were available (Figure 2A). As expected, most of the CpG units within the same target region showed high correlation. In addition, comparable high levels of correlation were detected also between CpG units in different amplicons, although they are several thousands of bases apart. Correlation levels were slightly but statistically significantly lower in tumor in respect to normal tissue (mean correlation values = 0.85 and 0.87 for tumor and normal tissue respectively, paired t-test p-value = 1.36 × 10−10). DNA methylation of rDNA locus in pair-matched normal and tumor tissues. (A) The correlation matrices of CpG sites analyzed in the 3 target regions (RiboPromoter, 18S and 28S) are reported for normal (left panel) and tumor (right panel) tissues. (B) The methylation levels of rDNA CpG sites are reported for 45 pair-matched normal (left panel) and tumor (right panel) tissues. (C) The boxplot compares, for each CpG site included in the analysis, the DNA methylation levels in 45 normal and tumor tissues. CpG methylation values for each available normal-tumor tissue pair are graphically represented in Figure 2B. Considerable inter-individual variation was observed for each CpG unit both in normal and in tumor tissues. Despite this variability, we found highly significant hypermethylation in tumor in respect to matched normal breast tissue for all the analyzed CpGs (paired t-test, p-value ranging from 7.97 × 10−12 to 0.017 depending on the CpG unit; Figure 2C). Comparable significant hypermethylation of rDNA regions in tumors was evident also in the 22 samples with missing normal matched tissue (Additional file 1: Figure S1). We recovered data on 66/68 tumors deeply characterized for clinical and pathological features (listed in Table 1) and, first of all, we investigated whether there was an association between this dataset and rDNA methylation profiles. Tumor samples were classified based on patient’s age, tumor histotype, size, grade (G), nuclear grade (NG), p53 status, ER and PR expression and proliferative index (Ki67) as indicated in Materials and Methods. We did not find significant differences in methylation status of rDNA between classes for investigated parameters, except for NG (Table 2). Indeed, a general trend towards rDNA hypermethylation was observed in NG = 3 samples respect to NG = 1 and NG = 2 samples (Figure 3A), with statistically significant differences (ANOVA analysis) for several CpG units within RiboPromoter; 18S and 28S (Table 2). p-values less than 0.05 are reported in bold. Relationship between rDNA methylation and tumor parameters. 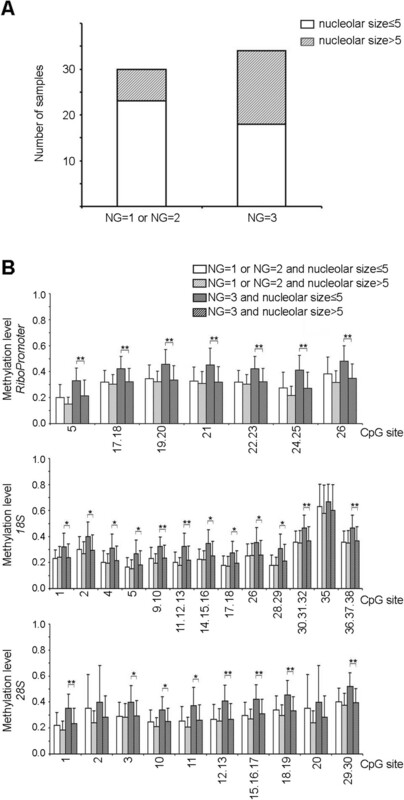 (A) Mean methylation levels of rDNA CpG sites in tumor samples divided for nuclear grade (NG). Standard deviation bars are reported. (B) Silver staining of two breast carcinomas. Note the higher quantity of silver stained nucleolar structures in left panel compared with those in right panel. (C) Mean methylation levels of rDNA CpG sites in tumor samples divided for nucleolar size values. Standard deviation bars are reported. There is evidence that the quantitative distribution of the nucleolar organizer regions (NORs) after their selective staining with silver is closely related to the rates of rRNA transcription and of ribosome biogenesis, thus representing a morphological parameter of the rate of ribosome biogenesis [24–26]. We therefore focused on evaluating the relationship between the rate of ribosome biogenesis estimated by measuring the nucleolar size after selective silver staining of NORs and rDNA methylation. We successfully silver stained and measured 64/68 breast tissue specimens (Figure 3B). In order to compare the rDNA methylation levels respect to nucleolar size, we divided samples into two groups on the basis of this parameter: 41 samples showed a nucleolar area ≤ 5 μm2, whilst for 23 samples it was more than 5. We found that several CpG units within RiboPromoter, 18S and 28S rDNA regions were differently methylated between the two groups (Table 2, Figure 3C). For all CpG units we found that lower levels of rDNA methylation were associated to a higher rate of ribosome biogenesis (Figure 3C). Considering that one of the parameters influencing nuclear grade classification is the presence of a prominent nucleolus, the results on nucleolar size appear in conflict with those on nuclear grade, being the average methylation of several sites of rDNA higher in NG3 tumors. To clarify this issue we evaluated the relationship between nuclear grade, nucleolar size and rDNA methylation. As previously observed [27, 28], a nucleolar area > 5 occurred more frequently in samples with NG = 3 than in samples with NG = 1 o NG = 2 (Figure 4A; chi-squared test p-value = 0.048). Interestingly in NG = 1 and NG = 2 samples rDNA methylation levels were not significantly related to nucleolar size, while most of the CpG units resulted hypermethylated when a NG = 3 co-occurred with nucleolar size ≤ 5 μm2 (Figure 4B). Relationship between nuclear grade, nucleolar size and rDNA methylation. (A) Classification of the analyzed breast carcinoma samples depending on NG and nucleolar size values. (B) Mean methylation levels of rDNA CpG sites in tumor samples divided in four classes depending on NG and nucleolar size values. Standard deviation bars are reported. Finally, we investigated whether irrespectively to the absolute value of rDNA methylation in tumor tissue, the extent of rDNA hypermethylation in tumor compared to normal matched tissue could be related to nucleolar size. To this purpose, for each CpG unit we calculated DNA methylation difference between tumor and matched normal tissue and performed hierarchical clustering analysis on these differences values (Figure 5A). Hierarchical clustering classified the 45 samples in 2 groups (indicated as A and B) ranging from low to marked rDNA hypermethylation of tumor tissue. 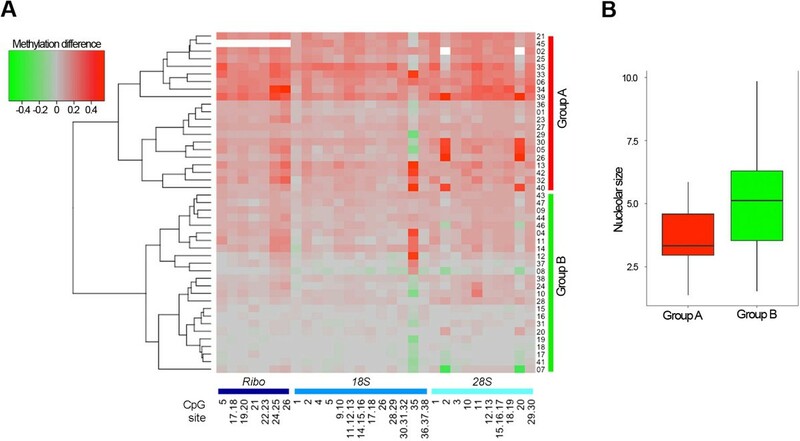 Interestingly, group B comprised samples with very limited or absent rDNA hypermethylation in tumor tissue, indicating that increased rDNA methylation is not a feature shared by all breast carcinomas. Subsequently, we investigated if nucleolar areas were different in the 2 groups resulting from hierarchical clustering. ANOVA analysis showed that nucleolar size was significantly higher in group B samples (smaller DNA methylation difference in tumor-normal tissue pair, i.e., lower hypermethylation in tumor samples) respect to group A samples (higher DNA methylation difference in tumor-normal tissue pair, i.e. stronger hypermethylation in tumor samples) (p-value = 0.006; Figure 5B). Similar results were achieved when only NG = 3 samples were considered (Additional file 2: Figure S2). No statistically significant differences were observed between group A and group B when the other clinical and pathological parameters were considered. Relationship between ribosome biogenesis and rDNA methylation differences in tumor-normal tissue pairs. (A) For each normal-tumor tissue pair, DNA methylation differences were calculated and subjected to hierarchical clustering using complete linkage method and a euclidean distance measure. (B) The boxplot compares nucleolar size values between normal-tumor tissue pairs, subdivided in two groups on the basis of the results of hierarchical clustering. DNA methylation is a key regulator of gene expression and of genome architecture, and defects in its regulation often occur in several human diseases, including cancer. As many other types of tumors, up to 50% of cases of breast cancer show hypomethylation of repetitive DNA sequences and transposable elements, which substantially contributes to genomic instability . 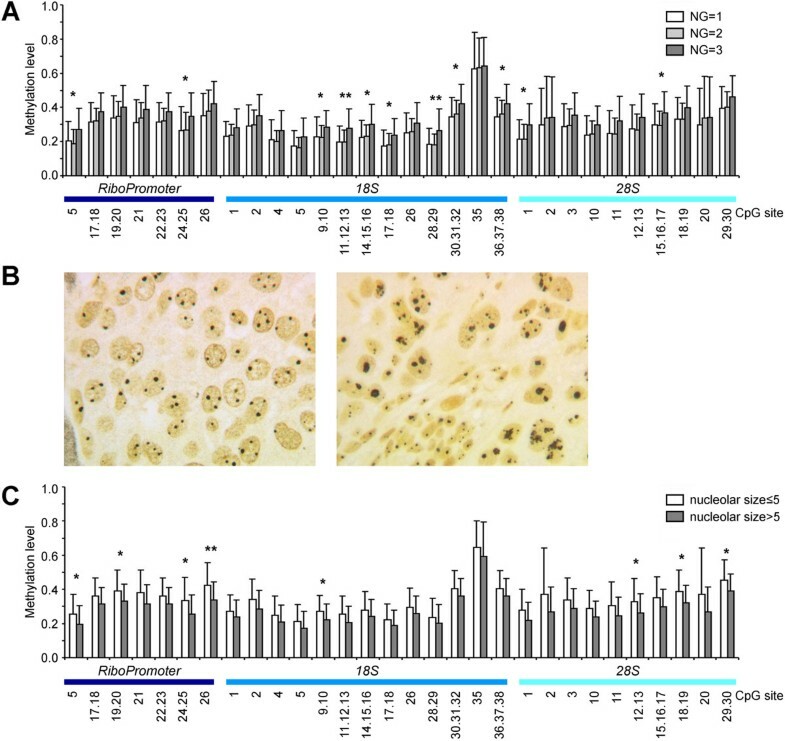 Moreover, genome-wide studies on tumor tissues and breast cancer cell lines have reported aberrant hypermethylation of the CpG islands of several genes, including tumor suppressors [30–33]. In this study, we specifically analyzed the methylation of rDNA genes in breast cancer tissues. Indeed, altered regulation of ribosome biogenesis is a common feature of many cancers, and it has been deeply investigated in breast tumors . In proliferating cancer cells, the rapidity of cell proliferation is strictly dependent on ribosome production [24, 25, 35]. This is one of the major factors contributing to the growth rate of a tumor mass inside the host, which is one of the most important prognostic factors in oncology. In human carcinomas the association of nucleolar hypertrophy with bad prognoses is noteworthy and there is an increasing amount of data that suggests an active role of the nucleolus in tumorigenesis [3, 36]. In line with this, ribosome synthesis has been also identified as a promising target for antineoplastic therapy [37–44]. The methylation status of rDNA promoter, which is CpG-rich in human [45–47], was investigated in breast cancer tissues respect to matched normal tissues. The methylation of two CpG-rich regions located at the 5’ of 18S and 28S sequences was considered too. Our data indicate an increased rDNA methylation in tumors compared to normal tissues. Although this finding is unexpected, as neoplastic transformation should sustain ribosome biogenesis and therefore rDNA hypomethylation, similar results have been previously described. Yan and colleagues showed increased rDNA methylation levels in breast cancer biopsies compared to normal control tissue and found that rDNA hypermethylation was associated with the oestrogen receptor negative and with moderately or poorly differentiated tumors . The technical approach employed in this work provided information about overall methylation status of rDNA, regardless to the epigenetic regulation of specific CpG sites . Our results confirmed rDNA hypermethylation in breast tumors using the MassARRAY EpiTYPER assay, a technique that allows to assess methylation levels with single base resolution and that is more sensitive and quantitative compared to Southern blot and to clonal-sequencing of bisulfite-treated DNA. This approach allowed us to deeply characterize DNA methylation profile of rDNA. As expected, in normal tissues the CpG sites in the promoter showed a strong correlation in their methylation levels. Moreover, also the methylation status of the CpG sites within the gene body (18S and 28S regions) resulted highly correlated, suggesting a tight control over the entire region in normal conditions. Correlation levels were slightly but significantly lower in tumor samples respect to normal controls, indicating that a loss in the epigenetic control, which is a common characteristic of cancer, occurs also in rDNA region. Surprisingly, rDNA methylation of normal breast tissues showed substantial inter-individual variation, ranging from 20% to 40% depending on the CpG site. The biological basis of this strong variability is not clear, although it should be considered that ribosomal biogenesis, and potentially also rDNA methylation, is strongly affected by environmental factors, such as the intracellular energy status . Yan and coworkers showed that higher rDNA methylation levels in tumor breast tissues were correlated with ER-negativity and suggested that they could be predictive of the tumor propensity to hypermethylate ER promoter. We did not find any significant association between rDNA methylation and ER status, but it should be considered that in our cohort ER negative cases were only a minor part of the samples (11/68 compared to 27/58 in the work by Yan ). On the contrary, significant association was found between methylation values of several sites of rDNA loci and NG and nucleolar size values. Although only some CpGs reached statistical significance, the entire locus showed the same trend in terms of DNA methylation variations, confirming a common regulation of the CpG sites within the region. The nucleolar size evaluation after its selective staining with silver is a well established method used in tumor pathology for tumor characterization, being nucleolar hypertrophy associated with bad prognosis. Together with nuclear polymorphism, the presence of prominent nucleoli is one of the parameters influencing NG classification. We observed that a subgroup of samples with NG = 3 but nucleolar size ≤ 5 μm2 showed higher rDNA methylation levels, suggesting that in breast tumors the methylation status of rDNA loci can affect the rate of ribosome biogenesis and somehow counteract other adverse pathological conditions. Accordingly, we identified a subgroup of patients in which the presence of large nucleoli was associated to limited or absent rDNA hypermethylation of tumor tissue respect to matched normal control. In these tumors the lack of rDNA hypermethylation could represent an important factor to cope with the need for a particularly intense biosynthetic activity. In addition, this observation confirms an epigenetic regulation of ribosomal biogenesis in breast cancer and indicates that the rate of rDNA hypermethylation can significantly differ between patients. Importantly, samples showing small tumor-normal tissues differences had higher nucleolar size, indicating that not only the rDNA methylation level, but also the extent of rDNA hypermethylation in respect to normal tissue could represent a marker of breast cancer progression and, in principle, could be explored as a potential prognostic marker for this tumor type. rDNA hypermethylation was described in other women’s cancers, including ovarian cancer  and endometrial carcinoma . The mechanisms and the dynamics that lead to rDNA hypermethylation in these tumors are not clear, also because tumor progression should in theory sustain higher levels or ribosome biogenesis, and therefore rDNA hypomethylation in respect to normal tissue. In all the cases, higher levels of rDNA methylation were associated to better prognosis and longer disease-free and overall survival, suggesting that rDNA methylation could have a role in the biological and clinical behavior of the tumors. One intriguing scenario is that rDNA hypermethylation may be a defense response against tumor progression, but further analyses are needed to explore this issue. With respect to previous studies, where the relationship between rDNA methylation and ribosomal biogenesis was not considered, we demonstrated for the first time that rDNA methylation is associated to nucleolar size in breast cancer. Future studies should assess if rDNA methylation affects the rate of rRNA transcription and therefore the proliferative potential of tumor cells. In conclusion, in this study we showed that i) the methylation status of the CpG sites within the rDNA promoter and the 5’ of 18S and 28S sequences is tightly co-regulated in normal breast tissue, while in tumor tissue it is slightly but significantly lower; ii) rDNA methylation tends to be higher in breast cancer tissues respect to normal counterpart; iii) rDNA methylation levels are associated to NG and nucleolar size values and iv) in a subgroup of patients larger nucleolar size is associated with limited rDNA hypermethylation in tumor respect to matched normal tissue. Maria Giulia Bacalini, Annalisa Pacilli contributed equally to this work. We thank Vilma Mantovani and Elena Marasco for their technical support during experimental procedure of DNA methylation analysis at CRBA (Applied Biomedical Research Center, S. Orsola-Malpighi Polyclinic, Bologna, Italy). This work was supported by grants from the Italian Association for Cancer Research (IG-11416) to L. Montanaro and from European Union’s Seventh Framework Programme (IDEAL project, 259679) to C. Franceschi. LM, PG, SS, CF, MGB and AP conceived the study and wrote the article. MGB and AP developed the methodology. MGB, AP, MP, DT, CG, CP carried out the experimentation, acquired the data and performed statistical analysis. All authors read and approved the final manuscript for publication.